In Devon we have been helping the managers of Exeter Community Centre to keep the building open while the community works towards making it a viable and vibrant facility. The three-storey Victorian terraced building that houses the community centre is part of the property portfolio of our joint venture partners Devon County Council. It’s high maintenance requirements and a constrained budget have caused the condition of the property to suffer over recent years. An extensive refurbishment will be required to achieve the vision of the Community Centre team. Our initial involvement was to work with the Centre’s management team to oversee some urgent repairs following a health and safety inspection. After ensuring that the building was safe for its users, we subsequently managed some roof repairs to stop rainwater ingress, and repaired the lift. 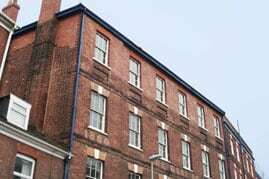 By keeping the building safe and usable, we have helped to provide a window of opportunity for the local community to produce a robust plan for its future. The St. David’s Neighbourhood Partnership, which has been formed by local residents and businesses, are keen to see the building refurbished and its ownership transferred to them. They are seeking central government funding to enable the project to go ahead, and we have provided advice for Devon County Council and the Partnership as to the likely costs involved. The Premises Manager of Exeter Community Centre has praised the way in which we have helped: “I cannot recommend more highly the professionalism of NPS, who have striven to involve themselves supportively with the Community Centre”.